At the Casa del Migrante de Saltillo, a migrant shelter in the northern Mexican state of Coahuila, a day’s journey to the Texas border, migrants are given food, medical care and legal aid. The number of people fleeing violence in Central America has surged to levels not seen since the region was wracked by armed conflicts in the 1980s, the UN refugee agency warned today, urging action to ensure that unaccompanied children and others receive the protection which they are entitled to. Last year alone 3,423 people, most of them from El Salvador and Honduras, sought asylum in Mexico, up 164 per cent from 2013 and 65 per cent from 2014, spokesperson Adrian Edwards of the Office of the UN High Commissioner for Refugees (UNHCR) told reporters in Geneva. “UNHCR considers the current situation in Central America to be a protection crisis,” he said, expressing particular concern about the rising numbers of unaccompanied children and women on the run who face forced recruitment into criminal gangs, sexual- and gender-based violence and murder. Mexico currently hosts 3,448 refugees, the majority of them from Central America. Costa Rica today hosts 3,616 refugees, mainly people from El Salvador. Costa Rica registered 2,203 asylum claims in 2015, up 176 per cent from 2013 and 16 per cent from 2014. In Belize, where the population is less than 400,000, 633 people sought asylum in 2015, a 10-fold increase over 2014. Nicaragua and Panama are also seeing similar sharp increases in asylum requests from people fleeing the Northern Triangle countries – El Salvador, Honduras and Guatemala. As in previous years, preliminary data from 2015 shows that the United States remains the main country receiving asylum applications from the Northern Triangle, on track to receive over 250 per cent more than in 2013 and almost twice the number of 2014, she said. The crisis in Central America urgently requires a stepped-up protection response and a regional approach to sharing responsibility for this growing crisis. UNHCR is working closely with the governments of the region and civil society partners to enhance screening capacity to identify people forced to flee violence and persecution in the Northern Triangle. 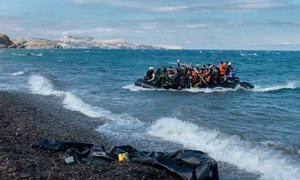 The United Nations refugee agency today urged parties to the recent EU-Turkey agreement on refugees and migrants to ensure all safeguards are in place before any returns begin.